The Paderno 14101-15 double-size steam pan can hold 485⁄8 quarts of food in a hot or cold bay. Rounded pan edges avoid warping, and the pan is made of sturdy, 18-gauge stainless steel. 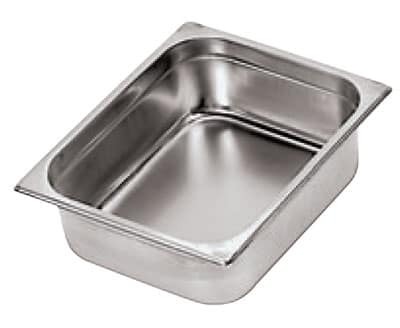 Stainless steel provides rust and dent resistance for lasting use, while the pan is seamless and leak free. To look professional, all surfaces have a mirror finish, and this pan can be stacked to save space. Not sure how steam pan sizes work? Take a look at this guide to food pan sizes to learn more about them.